Topic: The front is here. Re: The front is here. 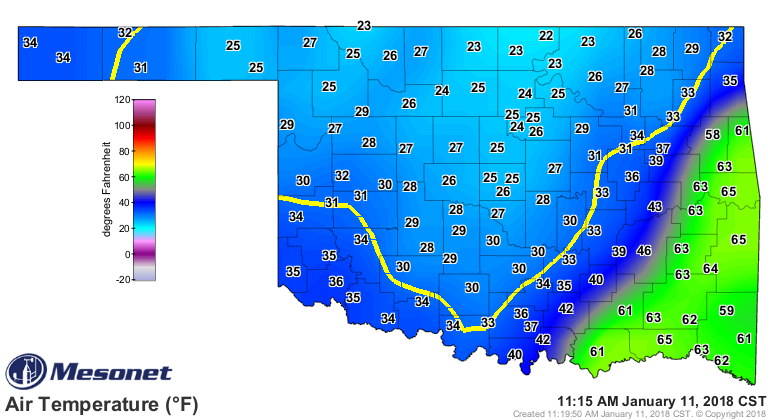 The front has been going through Oklahoma tearing up 60+ degree temps. It's been producing shelf clouds. It's 18F in west Tennessee and 62 in east Tennessee right now. The front is around Nashville. I'm sure the change will be noticeable when the front comes through. I hope I'm done with errands before it starts freezing! This is RAP model current temps you can see clear temperature differentials. If you upload to CWOP your data is used on this model. 30F in four hours may not seem like much to some, but the wind is vicious. Luckily the rain has moved out and only flurries are around. If the power stays on, we've dodged a bullet. I've brought in some firewood just in case. And they're predicting a reinforcing front in a few days. Brrrr! I'm ready for Spring! I grabbed the 12-hour temperature graph from m CWOP page. That's one to remember! Cool picture. Looks like one of those dust storms that come rolling in from the desert. Starting today it stays cool for the next week. Again Tired of this stuff. I went on a pants strike 2 weeks ago during the last cold spell. I maybe wear pants 2 or 3 times a year but last time it was all week. The den where this computer is located doesn't have any heat. It averaged about 45 degrees in here. Some really dry air is supposed to arrive Wednesday with most models predicting DP's around 10. Don't need a humidifier here today. Apparently Boston set a record yesterday for the highest January Dew Point Ever at about 65*. That coupled with a couple of inches of rain and I was thinking Spring! Then this morning the front came through and the temperature dropped 16 degrees in an hour and it's still dropping. Just curious how often you have to fill it and how much? Fill every 3 days with one of those 2 gallon garden watering cans. Holds 3.5 gallons in reservoir and uses about 1 gallon a day set at 45% humidity. Whats nice its easy to fill unlike the smaller PIA units. Just open the fill area and pour. I add 1/4 cap of water treatment per 2 gallons. We're obviously OT here, but I bought one of these last Jan. and it's been a godsend. It's dry enough here as it is and add the house's heater in the winter, brutal on the skin, everything. However I go by the dew point on the Vue console and keep the house in the low 50's year round. That equates to about the upper 40's humidity in the winter and upper 30's in the summer.